COLUMBUS, Ohio—Scientists are getting closer to directly observing how and why water is essential to life as we know it. A study in this week’s Proceedings of the National Academy of Sciences provides the strongest evidence yet that proteins—the large and complex molecules that fold into particular shapes to enable biological reactions—can’t fold themselves. Rather, the work of folding is done by much smaller water molecules, which surround proteins and push and pull at them to make them fold a certain way in fractions of a second, like scores of tiny origami artists folding a giant sheet of paper at blazingly fast speeds. Dongping Zhong, leader of the research group at The Ohio State University that made the discovery, called the study a “major step forward” in the understanding of water-protein interactions and said it answers a question that’s been dogging research into protein dynamics for decades. “For a long time, scientists have been trying to figure out how water interacts with proteins. This is a fundamental problem that relates to protein structure, stability, dynamics and—finally—function,” said Zhong, who is the Robert Smith Professor of physics at Ohio State. “We believe we now have strong direct evidence that on ultrafast time scales (picoseconds, or trillionths of a second), water modulates protein fluctuations,” he concluded. 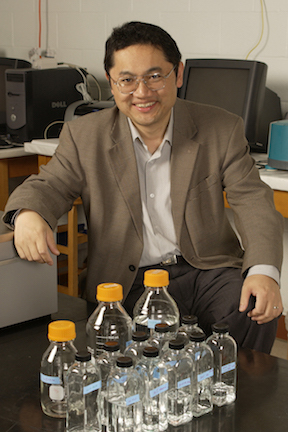 Zhong, who is also a professor of chemistry and biochemistry, and his team used ultrafast laser pulses to take snapshots of water molecules moving around a DNA polymerase, the kind of protein that helps DNA reproduce. The key to getting a good view of the interaction was to precisely locate optical probes on the protein surface, he said. The researchers inserted molecules of the amino acid tryptophan into the protein as a probe, and measured how water moved around it. Water molecules typically flow around each other at picosecond speeds, while proteins fold at nanosecond speeds—1,000 times slower. Previously, Zhong’s group demonstrated that water molecules slow down when they encounter a protein. Water molecules are still moving 100 times faster than a protein when they connect with it, however. In the new study, the researchers were able to determine that the water molecules directly touched the protein’s “side chains,” the portions of the protein molecule that bind and unbind with each other to enable folding and function. The researchers were also able to note the timing of movement in the molecules. Computer simulations at the Ohio Supercomputer Center (OSC) helped the researchers visualize what was going on: where the water moved a certain way, the protein folded nanoseconds later, as if the water molecules were nudging the protein into shape. Water can’t arbitrarily shape a protein, Zhong explained. Proteins can only fold and unfold in a few different ways depending on the amino acids they’re made of. Co-authors on the study were Yangzhong Qin, a postdoctoral researcher, and Lijuan Wang, lab manager. The work was funded by the National Institutes of Health, and computing time was provided by OSC.